After the successful spawning around a month ago, we split the eggs and reared them in cage nets in two black tub. After the hatch, I quickly set up a 3rd tub and filled it with around 20k hatchlings from the other tubs. 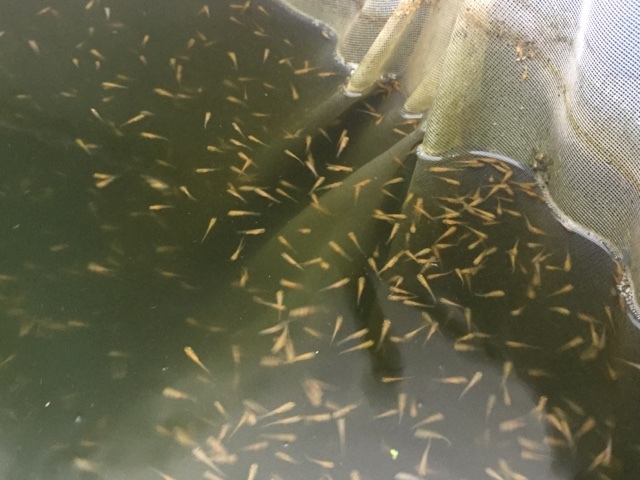 We’ve been nurturing the fry since then manually – it was always part of the plan to try this manual rearing to expand our repertoire of rearing skills, but its ended up being the only approach open to us because of the poor state in the outdoor ponds at the crucial time around 1 week post spawning. Maintenance has involved feeding, water changes, cleaning their tanks and splitting them into more cage nets as they grow. It’s been very hard work, and frankly, the fry wouldn’t have made it but for Amanda’s diligence with the feeding regime. After a couple of weeks, we clearly had a problem in one of the tubs , with daily losses. I resigned myself to losing those fry, and we tried various medications to see if we could rectify the situation – but that didn’t work, and in the end I ditched the tub; concerned about maintaining the good conditions in the other tubs that were situated next to the one with problems. All the other batches of fry are fine, and last weekend, we moved all the fry from the remaining 2 tubs into cage nets next within my growing on system – and that leaves us with 3 cage nets worth of fry currently being grown on in the growing on system. During the move, we also separated the shooters – these are the fry that grow far more rapidly than the others, basically, because they are eating their siblings. The size difference was eye watering in 2 or 3 cases. During the move, I took a closer look at some of the larger fry, and I can report that the pattern ratio is looking very promising…. More reminiscent of the july 14 spawning than the may 15 one. We’ll keep going with them to complete the mini project we’re trying with manual rearing of these fry and we stand a good chance of having something to show for this spawning at first selection – but the mind drifts easily back to the opportunity lost of having 10’s of thousands more if either or both of the fry ponds outside had not become poisoned. I guess that’s koi breeding – very difficult, and prone to problems , particularly in the early stages. - Sharkey has been a good spawner 2 years in a row, but I’m yet to rear any fry from her. - There was a lone female in my males pond…. And the conditions were obviously just perfect after bringing the fish home from the South of England show a few weeks ago for a flock spawning in the tank! So, goodness knows whether the remaining males will be up for another spawning so soon after their last one. You just have to smile.